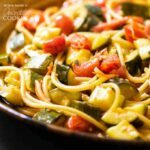 Zucchini and tomatoes tossed with pasta. It's a simple summer dinner that's fresh and light. Serve it with crusty bread on the side. Put a pot of water on the stove to bring to a boil. While you wait for the water to boil, melt the butter and olive oil in a large pan over medium heat. Add the zucchini and tomatoes to the pan and cook them, stirring occasionally. Once the pasta water is boiling, add the pasta and cook until very al dente, about two minutes less cooking time than the package suggests. While the pasta boils, continue cooking the vegetables. The tomatoes will start to break down and their juices will combine with the moisture released from the zucchini. Add the parsley and lemon juice. Add the pasta and toss to combine. Let the pasta cook with the vegetables for a another two minutes or so. It will absorb the light sauce as it cooks. Serve the pasta with grated Parmesan. This recipe for Simple Zucchini and Tomato Pasta was printed from AmandasCookin.com - https://amandascookin.com/simple-zucchini-tomato-pasta/ and can only be printed for education or personal use.